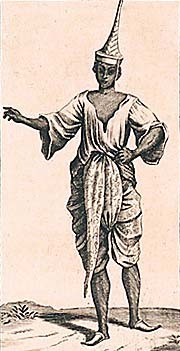 King Narai, called 'the great', in a French drawing. A Siamese Mandarin. Mandarins were the officials of the time. A Siamese house of the time. Some of the simple cottages nowadays look still so. 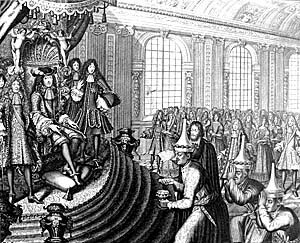 Simon de la Loubere (1642-1729) was a French envoy of the absolute monarch Louis XIV (the 'sun king'. 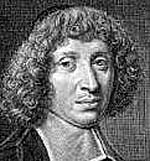 Most famous quotation: "I am the state!" Reign: 1643-1715) in historical Ayutthaya, Siam (nowadays Thailand). Although he spent only about three month in Siam, he wrote an interesting report about the Ayutthaya Kingdom and society for king Louis. It's is one of the rare documents about this phase of Siam/Thailand's history. To get an idea of the culture and lifestyle of pre-Bangkok Siam/Thailand and to compare it with the contemporary Thai society I emphasize just a few of Loubere's observations. 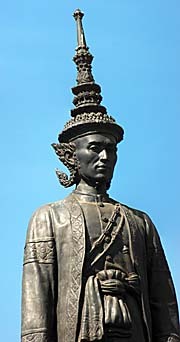 Ayutthaya was reigned by king Narai (reign: 1656-1688). After his death Narai's successor changed Ayutthaya's foreign policy to more isolation and expelled the French troops out of Siam. That was probably due to some problems the foreign visitors caused. They were demanding (e.g. wanted the king to convert to Christianity), tried to gain influence in Ayutthaya's internal politics; the French troops appeared arrogant and unhalted. Besides, a few years ago there was already a serios conflict between Ayutthaya and British troops which led to the killing of 60 English in Mergui (an Andaman Sea port, nowadays Myeik in Burma). 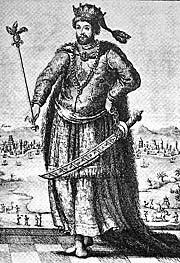 King Narai even declared war then on the British East India Company. A painting of Ayutthaya. In contrast to what Loubere wrote it's completely tilled. Might be it's dated from a later time (in the 18th century?!). Ayutthaya was situated on an island, surrounded by rivers and lakes. There was only a sixth of the area of the Island of Ayutthaya populated, the rest was empty. The populated part was the southwest of the island. There was a number of suburbs outside the island who contribute considerably to the population. The suburbs were divided into quarters of different nations and craftsmen. The roads were broad and straight, partially seamed with trees and brick-paved. The houses were wooden and low built. Most roads were paralleled by canals, which made Ayutthaya looking a bit similar to contemporary Venice. Many wooden, bad built bridges overspanned the canals. Some few were made of bricks, built in a clumsy way. The name 'Siam' was unknown to the Siamese. It is one of the words the Portuguese first used in India and it's source is barely discoverable. The Siamese called themselves 'Tai', what means 'the free'. In Ayutthaya the Siamese called themselves 'Tai noe' (Tai noi), what means 'small Thai'. The 'Tai yai', the 'big Thai', were wild people, living in the mountainous north (Lanna). They, as Loubere remarks, detracted from the tyranny of the neighbouring kingdoms (and Ayutthaya). There was an annual census in Ayutthaya. The Siamese counted 1,900,000 people, but Loubere supposed it to be highly exaggerated, and as well including the number of refugees who escaped the kingdom to live in freedom in the forests and mountains. The Siamese showed a great affection for their children, might it be their own ones or from other people. That's exactly how it is still nowadays. The Siamese could marry several women, but only some rich men did so. When having more than one woman one of them was the 'great women', the other(s) were inferior in status and had to obey her. When the man died, the minor wifes and their daughters could be sold into slavery. Also nowadays it's not seldom that rich Thai or Thai Chinese maintain a second woman (a 'small woman', called 'mia noi'). Loubere also describes the old story that the highest place is the most honourful, as the human head is the most honourful part of the body, while the feet are considered as being dirty. A Siamese wouldn't throw his hat on the floor, but put it on the top of a pole to keep it high up. In Nan I met an Englishman who told me the story that he dropped his hat on the floor in his hotel room and his Thai aquaintance scolded him for that. Many of these old customs are still alive. The Thai society is, despite the high-tech equipment of the 21st century, still a really traditional society. As nowadays status played a crucial role in all-day-life. There was no place more quiet than the king's palace. Everybody had strictly to care for silence there. They could take an example from that today as well, and everywhere. The Siamese are described as very polite, respectful and reserved; they must have been very convinced of anything to utter a different opinion as even a foreigner had about their own affairs. Smoking was a great pleasure, and not only the men but most of the women were smoking a lot. Loubere already wrote that it's obviously, that the Siamese were very much mixed up with the neighbouring people. The most dangerous sicknesses were dysentery and fevers, ulsters and cancers appeared frequently. Many of the diseases, the Siamese believed, were due to magic. That's still alive in Thailand, and even the superstitious walk to shamans and quacks is still common. In general, Siamese seldom became old. There were two languages in Siam: first, there was a common language which was simple and without declinations and conjugations, containing short words; second, there was a language of the scholars and upper classes, what was Pali. Pali was much more sophisticated than the common Siamese, used for justificial and religious expressions. Also the nicest songs were in Pali. King Narai had a number of nice, long boats, beautifully decorated. They were long and many oarsmen rowed them, what made them very fast even against the stream. 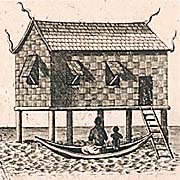 Many common people also lived on boats who had a cabin in the middle. Boat races did happen already, and the folk cheered to the rowers and bet on one of the parties for money. Tea was common in Ayutthaya, but not in other parts of Siam. It was a custom to offer guests a cup of tea. That's remarkable, because in contemporary Thailand there is little tea served. Only in a few Chinese restaurants one get's green tea regularly together with the dish. Crows and vultures were in Siam in a great number, Loubere notes, and even not shy at all, because the people fed them (as they do it with the dogs nowadays, while the crows and vultures mostly disappeared). They gave the vultures even the corpses of the children who died before the age of three or four. Mentioned is also cockfighting, what is still a passion of the Thai People. King Narai abolished it and the monks claimed that participants would be doomed to fight against each other in the 'other world'. Though, the abolishment didn't have much effect. Gambling was anyway a problem already - the Siamese loved gambling so much, that they wrecked themselves and their families. Sometimes they gave their children away in slavery for paying their gambling debts (they could also sell their minor wifes if they had more than one woman), sometimes they even had to go themselves in slavery for they didn't have anything else to sell. That's really not much better nowadays; although gambling is strictly forbidden in Thailand it's a big shadow economy. Chess is mentioned as well; it was played either in the 'Western' way or, different rules and figures, by Chinese rules. Six month of every year the Siamese men had to work for free for the king in drudgery. The king used most of the Siamese as it pleased him. When the Siamese men didn't work for their king, they did very little. No hunting, no physical exercise, but sitting, lying, smoking and sleeping. His wife waked her husband up at seven, gave him rice and fish; after eating he rested again and the same was repeated at noon and dinner time. Sometimes the men were gambling and visiting friends or receiving guests. The women therefore worked on the fields, bought and sold on the markets, cared for the children and their men. This mentality is still very widespread in nowadays Thailand. When Siamese owned land they could sell it or buy more. It was just that they never were sure to keep it, because the king was the only one who didn't respect the property of the people and took what he wanted. The most valued property therefore were diamonds, because they are small and easy to hide from the kings appetite.